Maps of stable (stabile) cadaster contain number of different marks and symbols. I have decided to translate the key to those maps to English so anyone interested is able to find out what the symbols mean. And after three hours of work on this key I have decided to provide it not as free download but as my first-ever paid downloadable file. 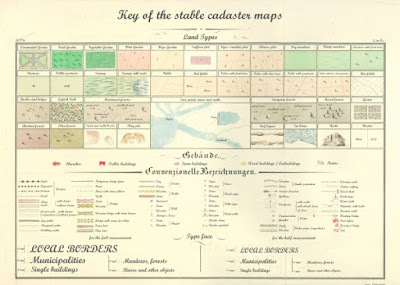 Stable cadaster maps key (click on the image to buy). If you are interested in the key in JPG or PDF file, let me know on my e-mail blanka.lednicka@nase-koreny.cz. Payment is done through PayPal. Thanks for making this map key available; it's beautiful! 1.) One of your land types is a "red field", what is that? 2.) Also, on the cadaster map of my favorite town (ceska Trebova) a section of forest on the outer edge of the town and was owned by Prince Aloys Joseph Liechtenstein, is labeled Hirschengraben. Could that indicate a deer park/ hunting reserve? or just a place name after the street in Zurich? or something entirely else? Hello Diane, thanks for the correction about the red fields, I have sent an update. I think it's a real masterpiece to read maps right. You can learn this yourself or attend special courses to make your skills better. Also it won't be spare to look through reviews on Englishessays.net and to make conclusions aсcording to your situation.